Below are links to luthiers, websites, and places of interest. In other areas of the website you will find links to many of our suppliers. Violin family and fretted instrument repair. Repair and restoration of string basses. Mr. Curtain is one of today’s foremost violin and viola makers. His website has many interesting articles related to the violin. 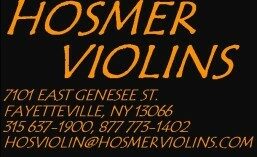 Organization dedicated to furthering interest and knowledge of violin family instruments and bows. The IPCI-USA (International Pernambuco Conservation Initiative) is a not-for-profit organization dedicated to the conservation and sustainable use of the wood that quality bows are made from. If you have ever wondered how violins are made, check out this link. It’s probably the most complete pictorial available. Michael is a wonderful writer, so also check out the rest of his site. They have many different lines of strings. My favorites are a combination of Kaplan Solution (A, D) and Helicore Cello (G, C). The new standard (as far as I am concerned) for inexpensive strings are their “Prelude” line. Look to them for the future of string inovation. Andrew Zaplaytynsky is the concertmaster emeritus of the Syracuse Symphony. His website contains a wealth of information on string playing and music. I have known Joe since he was about 10 years old, when he was actually smaller than me. He’s a terrific musician and teacher in many styles from classical to celtic. He teaches both adults and kids. The American String Teachers Association is a professional organization serving string teachers, orchestra directors, professional players-and through them-the general public. The above link is for the New York chapter. Click www.astaweb.com for the national site. The best science teacher I never had. Alton Brown is the host of Food TV’s “Good Eats,” the Peabody Award-winning food and science show. What does this have to do with violins? It’s said that music feeds the soul, but the body needs something else. His approach to the science of cooking is very much like the procedures of the violin workshop. The website is a hoot; Alton’s recipes can be found on his FOOD TV page.